Helping a senior take a bath or shower is an important upkeep process during someone’s elderly years. Different people need varying degrees of help. But, regardless of how much you will be assisting, a general set of tips will make the process easier for both you and the senior you are aiding. It can be uncomfortable for someone who used to bathe on their own to have help. It’s not easy to come to terms with the idea that they may need help. Try to be understanding of the situation. And, be patient. Taking your time with the process is a great way to show that you are understanding and that it’s okay. There may be some initial embarrassment and reluctance at first. This is natural. It is easier on everyone involved if you understand that patience makes it a smoother and easier process. It’s often recommended that the senior has some sort of grip within the bath/shower. This includes mats on the floor, handrails, or chairs to sit on in the shower. There are non slip mats available for in the shower as well as mats for the outside of it. They can prevent major slips and falls. Falls are a major hazard to avoid with seniors as they can cause serious injury. More specifically, one in four seniors fall each year. And, one in five of these seniors will suffer horrific injury. 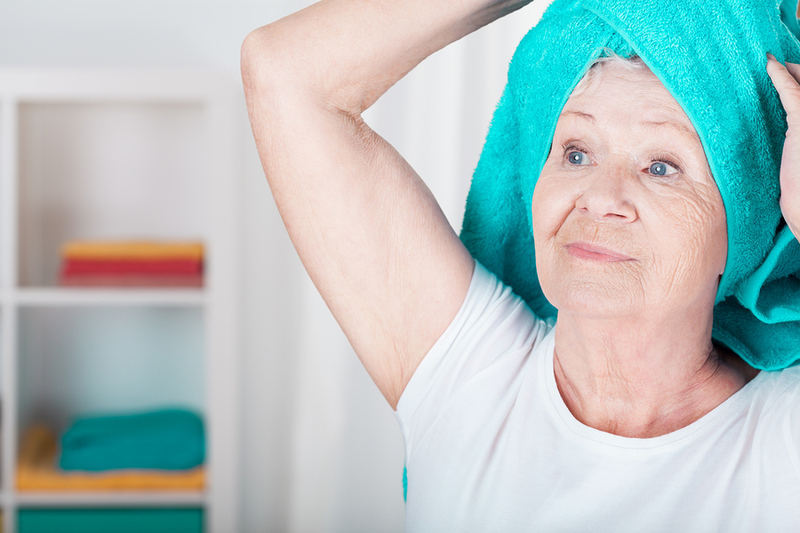 Falling in the bath or shower is among one of the most common places that seniors fall. Having a towel ready for when you are done assisting a senior with a bath or shower can make the process that much easier. When the towel isn’t already ready you will have to roam to find one. And, it can leave your senior cold and irritable. You’ll want to avoid this situation as it can make anyone reluctant to the process. This can often be a step that is ignored or just missed. But, it can cause some serious harm or discomfort if not watched properly. Just make sure to quickly test the water before helping any senior get into the bath or shower. No one likes getting into a scalding or freezing bath. Allow some sort of privacy in whatever way deemed appropriate between you and the senior you are aiding. All of us have varying levels of privacy that we are comfortable with. But, most of us do want to retain some sort of privacy within most situations. To whatever extent that is, just remember to try and be respectful of it to the best of your ability. Some aspects of privacy are inherently taken away when having to aid with a bath or shower. But, little things to maintain some semblance of privacy can be greatly appreciated. This can be something as simple as allowing someone to use a towel to cover up during the bath. And, a general decline in hygiene can cause a person to feel embarrassment and eventually even lead to feelings of depression. This can be in part due to the feeling of no longer being in control along with all of the other changes and transitions that come in our senior years. Beyond that, skipping showers or baths can eventually cause skin infections. This is why it’s important to follow steps to make it a process that seniors want to keep up with. If you are a senior realizing you may need some assistance with bathing, showering, or grooming in general, you may benefit from the addition of an in-home caregiver. Grooming and bathing assistance are common practice among in home care aides. These services are among the many that home care aides provide on a daily or weekly basis. Take a look at the senior services provided by the home care aides at Homecare Powered by AUAF. If you have any questions about us or our services give us a call at 877.721.6710. We are always happy to answer any questions you may have. These tips on giving a bath to a senior are a good start when it comes to what you need to look for. But, you may find there are even more aspects that you can incorporate. It will be different with each person and the varying degrees of independence each senior that you work with has.